Continuing the "trapped in a MMORPG" trend is Overlord, an anime based on a light novel and one that came out recently this summer. But don't judge it because it's plot is similar to Sword Art Online and Log Horizon where the main character is trapped in a game, because those two are different from one another - despite similar plots - when you delve deeper into their stories. If you don't believe me, I have done a comparison of the two which you can check out here, and I recommend watching both of them. Anyway, back to Overlord. The game featured in the anime is a Dive MMORPG (or DMMORPG) known as Yggdrasil. Back in its hey day it was a big hit, but there was an announcement that the servers were going to shut down which gradually made players leave. Main character Momonga is staying in the game until the time the servers shut down, so he goes around his guild to see what he can do before the servers turn off, such as changing the settings for one of the guild's servants. But just as he's hoping to be logged out when the time hits 00:00, he notices that he's still in the game, only he can't contact the GMs or access the in-game menu, similar to Log Horizon. He sets off to summon all the servants to see whether or not they are faithful to him before he plans to find out what is happening in this "new" version of Yggdrasil. The characters in Overlord are a funky lot too, since it's a MMORPG. Including Momonga, they all have an inhuman look about them, despite a few of the female servants looking more human than the others. I guess it's because the guild would only accept players with inhuman appearances and this meant the servants should look it too, but this makes the anime more original. Also I don't think we'll ever see how Momonga looks in the real world. 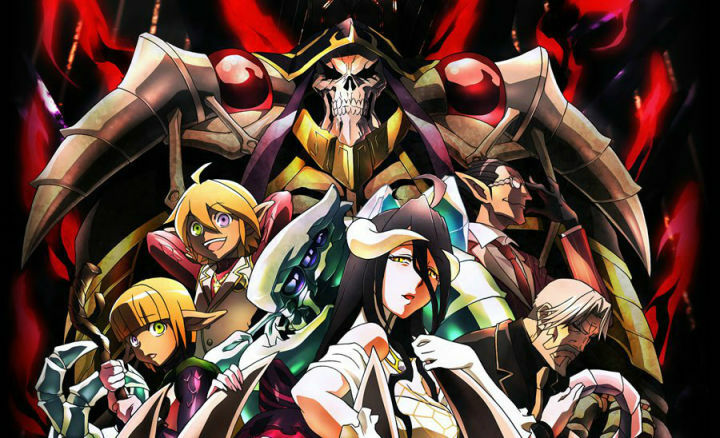 Though Overlord uses the same formula used in Log Horizon and Sword Art Online overall, it delivers it in its own way, thereby distinguishing it from both of them. It also has the funkiest OP in my opinion (anyone else agree?). If you don't believe that these anime are different, check out the comparison for SAO and LH, and I will do a comparison of the anime to Log Horizon and Sword Art Online, so expect them soon. Until then, I would recommend this to fans of LH and SAO, and to those who haven't yet seen an anime with this plot. Just don't judge them because they all have the same plot.